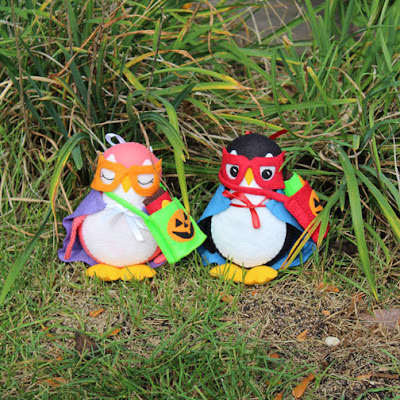 The Sassy Pack Rat: My Porter the Penguin's Superhero Costume Is Done In Time For Halloween! My Porter the Penguin's Superhero Costume Is Done In Time For Halloween! The Superhero Costume is done and in my shop! I know I was cutting it close, but the costume can be used for imaginary play too. Who doesn't want to be a Superhero?! 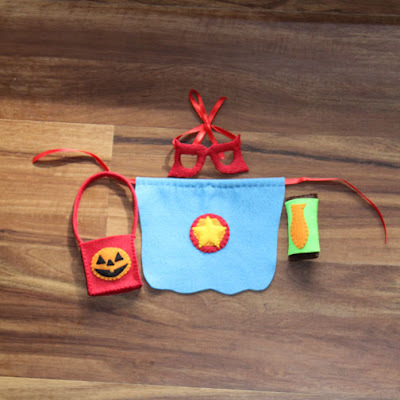 The PDF set comes with a medallion cape, mask, treat bag and fish flavored chocolate bar. Super easy to make and to make the whole process easier just glue the smaller pieces on and glue the mask together. What does it look like on the Penguin? I made more of the typical gender colors, but mostly because purple is my favorite color so one of them was getting that purple cape! 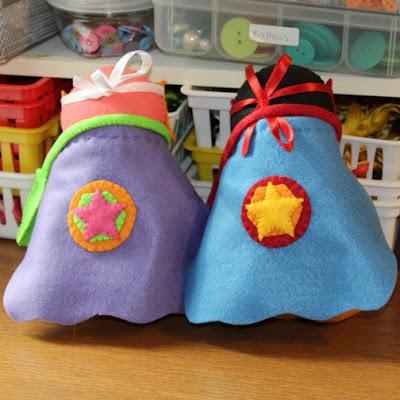 Make your Superhero's outfit any color you and/or your child wants and have fun! I have reduced the add-on accessories pattern's prices and the Penguin with the original accessories combo have both been reduced through the holidays! You won't want to miss that! I plan on, fingers crossed, a Christmas add-on set, but with the Christmas Pattern Club not sure I'll have the time. If you are interested seriously let me know and I'll get something done! Don't forget to join the Christmas Ornament Pattern Club! Sign ups start November 1st! I love that you are making patterns. Thanks so very much Cindi! Sammy The Seahorse PDF Pattern Is Done!